Here is a marketing conundrum that has bothered me for a while: How do you market a product that most people buy for a reason you can't acknowledge? Dr. Rob Moser says on WebMD that Q-Tips are weapons of ear destruction. 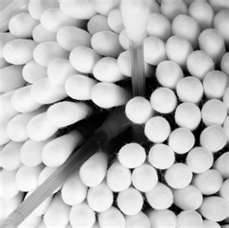 But seriously, against all medical advice and Q-Tip marketing to the contrary, we buy Q-Tips to STICK IN OUR EAR. Marketing VP: Well, sales are up this month. Marketing Peon: LOTS of dirty ears out there, huh! Marketing Director: The results are clearly the results of our improved packaging. The image of the Q-Tip vaguely near the baby's nose is really moving product. Marketing Director: Yep, once we incorporated that image of the Q-Tip pointed at an outdated- looking computer keyboard, sales really started moving. Marketing Peon: Wow. Marketing Q-Tips is really hard. At least we don't call them Baby Gays anymore. Talk about awkward. Marketing Team: (Holding ears) LALALALALALALALA!!!! Any other awkward marketing meetings going on out there? What other products do people buy for reasons that can't be acknowledged?